IMS can provide Lean training in all of the fundamental tools of Lean improvement. IMS has instructed companies in virtually every topic of Lean-related concepts, and is adept at building customized Lean training programs to fit a variety of needs. Why Do Lean Training with IMS? IMS' lean workshops will enable employees to gain an understanding of why to improve and how to improve the work that they perform within the business. Through learning, they become part of the solution and a valuable asset in the competitive environment. Employees will walk away with real techniques that can be applied directly to their work. Tim Dromboski is the founder and principal of IMS. He is IMS' lead lean training instructor and has conducted over 100 seminars and workshops during his consulting career. Tim is a dynamic and engaging speaker and his expertise lies in relating the teaching concepts to the work that the participants perform. Drawing on his vast experience in both lean training and lean consulting work, he has a unique ability to share examples that connect with the audience, while enabling learners to both understand the concept and also see how it can work in their setting. 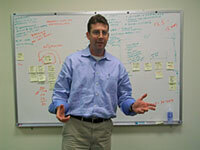 Tim has worked in a broad array of hands-on positions prior to becoming a lean consultant. He continually references his own personal experiences to give merit to his presentation. The fact that he has connected with such a diverse audience - from PhD scientists to the newest shop floor worker - speaks volumes about his personality and influential style. Please complete our contact form for further assistance with lean training services.